LASIK Powered by iDesign LASIK is Similar to Technology used in NASA Telescopes! The Orange County LASIK Institute has now upgraded our iLASIK and PRK technology to iDesign. 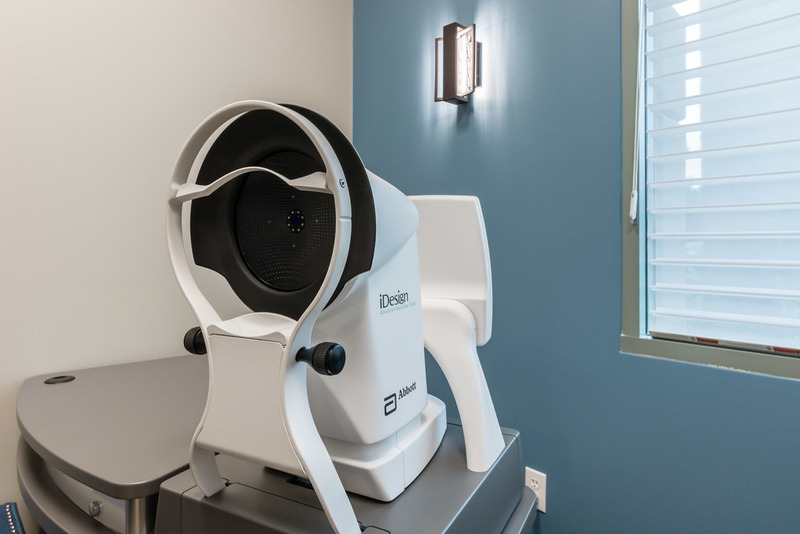 This innovative custom and wavefront guided technology allows us to treat lower and higher aberrations (imperfections) in the human visual system. This technology has been used by NASA! The development of the sensor technology within the iDESIGN System was the result of an earlier discovery by Abbott scientists NASA used this technology to accurately measure and shape the mirrors in the James Webb Space Telescope to ensure it will transmit high resolution images of deep space back to earth. The James Webb Space Telescope launches in 2018. What is iDesign Customized LASIK? The idesign is involved in the first step of your procedure. It is part of wave scan technology where a specialized sensor measures and maps your eye. This information is then used to deliver a completely custom iLASIK procedure. This wavefront guided technology is used to map your eye's lower and higher order aberrations and then treat them with the laser. The image is comparing the wavescan of the sample key placed over the artificial eye. As you can see, the capture of more refractions (measurements) in the iDesign allows for a more accurate mapping of the key. However, the iDesign is not approved for all prescriptions. Dr. Pham will be happy to discuss with you which technology (CustomVue or iDesign) is best and FDA approved for your prescription. The Orange County LASIK Insitute is proud to offer OC's first idesign 2.0 upgrade. We were one of the first in the nation to offer this upgrade on proven technology. iDesign 2.0 improves upon previous custom guided technology. Learn more by clicking the link below. Improved fixation targets for decreased accommodation. WARNINGS AND PRECAUTIONS: LASIK is not recommended in patients who: a) have a history of Herpes simplex or Herpes zoster keratitis, b) have severe allergies or tendency rub their eyes often, c) are taking the medication Isotretinoin (Accutane), d) are taking antimetabolites for any medical conditions. The safety and effectiveness of this laser for LASIK correction have NOT been established in patients: a) with progressive refractive errors; previous corneal or intraocular surgery; or trauma in the ablation zone, b) who are taking the medication Sumatriptan (Imitrex) or Amiodarone hydrochloride (Cordarone), c) with corneal neovascularization within 1.0 mm of the ablation zone, d) over the long term (more than 1 year after surgery), e) for patients who engage in activities that could endanger or damage the LASIK flap, f) for patients who have a family history of degenerative corneal disease, g) history of inflammation of eye, h) for patients who have a history of crossed eyes (strabismus) or who have undergone strabismus surgery, i) prior LASIK or Refractive Surgery, j) with history of any eye diseases or abnormalities such as: corneal scars or active disease, k) whose BSCVA is worse than 20/20. To reduce the risk of corneal ectasia, the posterior 250 microns (μm) of corneal stroma should not be violated. The treatment of highly myopic eyes necessitates the removal of significant amounts of corneal tissue. The iDESIGN® System calculates the estimated residual bed depth using the pachymetry and intended flap thickness entered by the user. Actual flap thicknesses may vary. If the estimated residual stromal bed is ≤ 320 microns, an in-the-bed pachymetric measurement should be performed.